It's common knowledge among my friends that I love to bake cupcakes. I bring them to parties and get-togethers often, varying in different shapes, sizes, and flavors. I love to experiment with them! In fact, I once even accidentally brought cupcakes to my own surprise birthday party! (I showed up looking disheveled in PJs and a bathrobe, with no make up on! It was knee-deep into tax season and I had been working late nights and weekends. Hubby had taken me to my surprise party and allowed me to walk out of the house looking like I did, thoroughly amused by my appearance. So utterly uncalled for! I thought we were going to a casual Sunday night get together with a couple of close friends and didn't feel it necessary/didn't have the energy to care about what I looked like). I love everything about cupcakes, especially the fact that you can get very creative with decorating them! 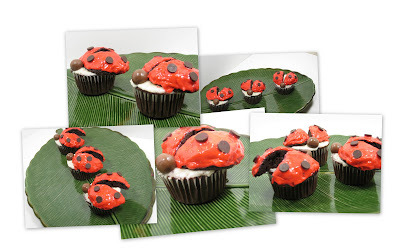 That's why I was super excited when I browsed through the Martha Stewart Cupcake book and came upon a page featuring lady bug cupcakes! They were soo cute that I just had to make them! After they're cooled, cut the tops off. Frost the bottom with frosting and cut the top in half. Place the two top halves on the cupcake at an angle, to create the wings. So cute already! Hubby put them on my leaf plate, for added effect! Frost the tops with red frosting. Add a Whopper for the head. Add chocolate chips for the spots! I even made ones with hazelnut frosting. So yummy! 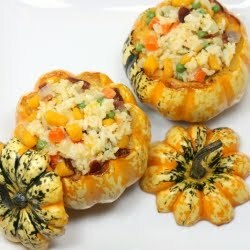 These were super fun and easy to make!